Robert Bolt’s historical drama A Man For All Seasons proves to be as chillingly prescient as it is involuntarily contemporary. A program note for the splendid Roundabout Theatre revival has this to say: "A Man For All Seasons deals with an age less fastidious than our own. Imprisonment without trial, and even examination under torture, were common practice." The play, an accounting of one great man’s unexpectedly steadfast dedication to conscience, country, and church, remains one of the 20th century’s most lauded plays. As directed by Doug Hughes and starring Frank Langella as the titular Sir Thomas More, this production also speaks well of the indestructibility of Bolt’s text, as well for the indistinguishable force of its theme. Although it is impossible for some of us not to harbor memories of Paul Scofield as More in the original 1961 Broadway production or in the 1966 film version, Frank Langella’s impassioned performance as this most noble of men has all the elements of More’s empowering glory. Langella, who is fresh from his Tony Award winning portrayal of Richard M. Nixon in Frost/Nixon (Curtainup revew) is an imposing actor with a beautifully resonant voice. He seems cannily suited to take on the most challenging roles in the canon of dramatic literature. Sir Thomas More is one of them. More’s life as renowned lawyer and attentive husband and father is given a bracing and piercing eloquence by Bolt, an eloquence that Langella brings to the fore. However, it is the subtle strokes of humor in Bolt’s text that Langella delivers with an aplomb that is uniquely his. Moreover, the humor is achieved without ever compromising the exalted spirit of this sainted man. Doug Hughes’s direction is all that it should be. He's staged this inspiring and impressive spectacle that explores More’s dispute with King Henry VIII and his plan to sever England’s ties to the Catholic church and marry Anne Boleyn with a conscientious consideration of it being the play's first major Broadway revival. He has also removed the character of the Common Man, a Brechtian affectation that, however representative he is of us, isn't missed a bit. Some very fine performances add to this engrossing and soul-satisfying experience. Jeremy Strong slinks around with duplicity afoot as the upwardly mobile perjurer Richard Rich. Michel Gill is opportunistically wishy-washy as Duke of Norfolk, and Maryann Plunkett and Hannah Cabell are perfectly paired as More’s devoted wife Alice and daughter Margaret. Their beautifully played farewell to More as he awaits his fate in a prison cell is only one of many unforgettable scenes. Michael Esper, making his Broadway debut, is winningly impetuous as Alice’s suitor and future husband William Roper. Dakin Matthews, as Cardinal Wolsey and Zack Grenier as Thomas Cromwell, are right on target as a pair of politically motivated schemers. Grenier, in particular, creates a conspicuously insidious figure whose "I do things for the King" has enough venom in its implication to fill a vat. 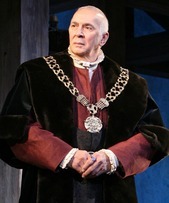 The most surprisingly exciting portrayal is given by Patrick Page, as a notably dashing, if highly volatile Henry VIII. Page, who you may have seen as Broadway’s Grinch in How the Grinch Stole Christmas and as Scar in The Lion King, is a far cry from the pudgy image that came courtesy of filmdom’s Charles Laughton. Henry’s unexpectedly glib exchange in classical Latin with the literate and well-schooled Margaret earns a hearty laugh. Triney Sandoval gives a wonderfully droll performance as Eustace Chapuys, the Spanish Ambassador. Set designer Santo Loquasto has created a large wooden structure with moveable panels that adapt for both indoor and outdoor locales. Catherine Zuber’s costumes are stylish and mostly muted, but the orange gowns worn by Alice and Margaret are stunning as is Henry’s gold and bejeweled attire. In consideration of the functional unit set, David Lander’s lighting goes a long way towards establishing the excellent atmospherics. Just as Shakespeare’s history plays seem to be growing more ominously relevant to our times, so is Bolt’s insightful history of a moral and ethical man who maintains his standards in the face of a government that trashes its country’s laws to suit the whims of an egotistical imperious leader. Coming at this point of our 21st century history, this revival of A Man For All Seasons makes us realize that we have not come a long way from Hampton Court in the 16th century. While this is indeed the first Broadway revival of A Man For All Seasons, the play is not quite in the totally neglected category. The film starring Paul Scofiled is still available as a DVD (Netflix even has it available for instant viewing). Two revivals have crossed Curtainup's path fairly recently, the first two years has ago in London (review) and another at Berkshire Theatre Festival review. Since the BTF production was so recent I was a bit apprehensive and yet eager to see this Roundabout revival — apprehensive because it is after all a long, talky play; but eager to see it with the magnetic Frank Langella playing More. Langella is indeed the More needed to make this play not just worth seeing but riveting. The humor he manages to inject even when More's life reaches its most tragic impasse, is as Simon observed, what makes this performance uniquely his. My reservations about the lack of genuine marital warmth between Eric Hill's More and Diane Prushka's Alice in the Berkshires vanished as I watched Langella and the superb Maryann Plunkett. Since I thought the character of the Common Man was very well done in the previously seen production, I thought I'd find myself disagreeing with Simon about that Brechtian device not being missed. However, director Hughes and his design team have indeed rendered the Common Man unnecessary. As long as these added comments to Simon's on the mark review, bring up the Berkshire Theatre Festival, it was also interesting to see Michel Gill who co-starred in BTF's other summer '08 revival, Candida, show up on the American Airlines Stage as the Duke of Norfolk who, like so many men, don't have the steely conscience to stand firm when under duress. I second Simon's praises for Gill as well as the rest of the ensemble's performances. Cast: Frank Langella (Sir Thomas More), Hannah Cabell (Margaret More), Michael Esper (William Roper), Zach Grenier (Thomas Cromwell), Dakin Matthews (Cardinal Wolsey), George Morfogen (Thomas Cranmer, Archbishop), Maryann Plunkett (Alice More), Michel Gill (Duke of Norfolk), Jeremy Strong (Richard Rich), Charles Borland (Jailor), Peter Bradbury (Steward, Matthew), Patricia Hodges (Catherine Anger, Woman), Triney Sandoval (Thomas Chapuys), Emily Dorsch (Barmaid, others), Alex Cole (Attendant) , Elizabeth Gilbert (Attendant), Miguel Govea (Attendant), Einar Gunn (Attendant).